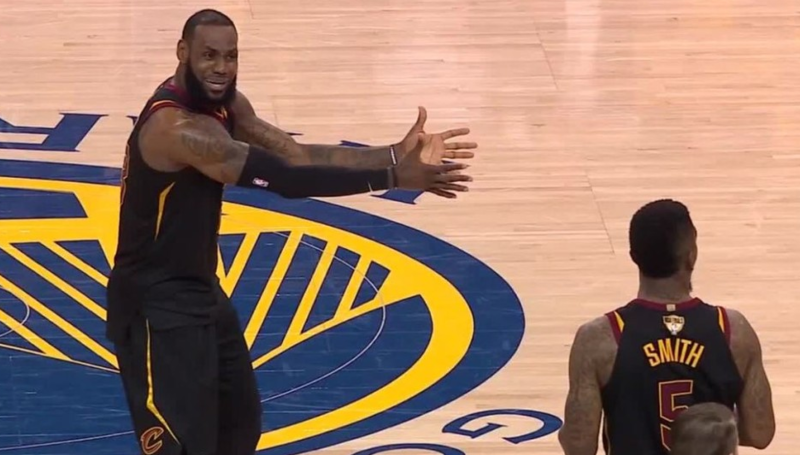 Everyone remembers game one of last year’s NBA Finals between Golden State and Cleveland as the JR Smith game. After rebounding a missed free throw with just under 5 seconds left Smith dribbled out the clock, not realizing the Cavs weren’t winning but rather tied with the Warriors. There was another play that was swept under the rug a bit because of Smith’s high profile blunder. With just under a minute to go in the game the Warriors’ Kevin Durant was driving to the hoop when LeBron stepped in front of him to take a charge. The refs originally called it a charge, which would have given the Cavs the ball and likely secured a win. Instead, it was overturned and Smith’s play will forever live in infamy. If I had my way we would do away with charges because it’s almost impossible to tell at this point who is in the wrong on these calls. It might be even worse in the college game. That will never happen but there is one legendary player who hated charges as much as I do but for different reasons — Kobe Bryant. “I’ve seen them take charges and lay there with a messed-up back. I’ve seen Michael not take one … charge and he’s healthy his whole career, and the same thing with Magic,” Bryant said. Bryant avoided taking charges to prolong his career to avoid wear and tear on his body. And it worked until injuries finally caught up with him at the tail end of his career. Bryant played for 20 years, finishing in the top 15 for most games played of any player in NBA history. The longer I’ve worked in finance the more impressed I am by a person or firm’s ability to have longevity in the field. I’ve witnessed countless firms, funds, and portfolio managers blow up over the years and close shop. To a lesser extent, the same is true in the blogging world. I’ve followed plenty of bloggers who came out swinging, who now have defunct sites that are never updated anymore. Staying in the game, any game, for a lengthy period of time is hard. Multi-millionaires go bust on a regular basis. Saving money is hard because it takes time to bear the fruits of compounding. My podcast co-host Michael Batnick found the median retirement balance in the United States for people ages 56-61 is $25k (meaning half the people have less than this amount). This balance could have been accomplished by investing as little as $6 a month starting in 1980 into a 60/40 portfolio. Picking an investment strategy or philosophy is easy. They’re a dime a dozen these days. But sticking with a strategy or philosophy is often unbearable for many because the temptation always exists to tinker, trade, or completely alter the way you manage money. Set aside some frivolous spending money every once and a while. Personal finance experts love extolling the virtue of frugality. And I get it up to a certain point, but depriving yourself at all times is no way to go through life. Everyone deserves to spend guilt-free on occasion (within reason) just to scratch that dopamine itch. You just have to go about it in an intelligent fashion by spending that money after your savings targets have been hit. Find a behavioral release valve for your portfolio. Take a small percentage of your portfolio and go to town on penny stocks, crypto trading, inverse ETFs, or stocks on the 52-week low list. Give yourself the ability to light a small amount of money on fire knowing the rest of your portfolio is managed more prudently. Take less risk. I met with a family office a couple years ago that managed a 9-figure portfolio who was worried about everything you could imagine. After trying, but failing, to assuage their fears of global debt, market crashes, and hyperinflation I finally told them there was no strategy that would always and forever protect their money and if they were really so worried about losing money they should simply hold more cash and take less risk. And that’s exactly what they told me they did. They held 10-20% of their portfolio in cash. This makes no sense in terms of Harry Markowitz portfolio theory but it’s how they were able to stay invested elsewhere without dumping their entire portfolio. Personalize your benchmark. Benchmarking is probably one of the worst aspects of the institutional asset management world. These huge sums of capital are constantly comparing their portfolios of professional money managers to their peers, indexes, and geeky math formulas. I get why they do it but it’s probably caused more problems and money lost than most would care to admit through a combination of career risk, moving the goalposts, and a misunderstanding of their own resources, time horizon, and risk profile. In an effort to outperform the markets and their peers, they end up underperforming their own investments in most cases. Individual investors have the ability to personalize their benchmark or drop them all together to stay in the game. You don’t need to worry about beating the S&P 500. You’re better off trying to not underperform your own holdings by making poorly timed trades and portfolio shifts. The only benchmark any investor should care about is whether they’re on track to reach the goals they set up their portfolio for in the first place.